Help Teach Good Pet Guardian Lesson Plans in Detroit Schools - Watch this very moving video and donate to this important campaign! 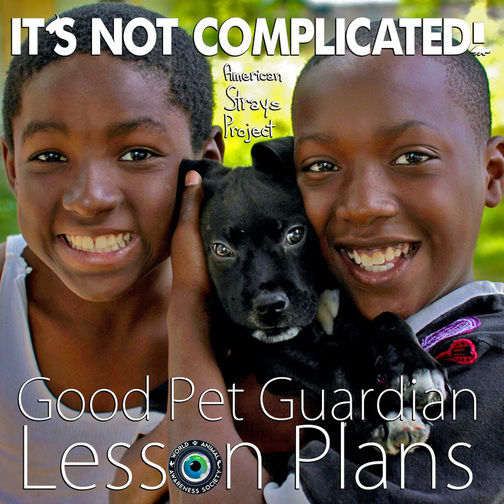 Invest In America's Youth - Make A Donation To Produce The "Good Pet Guardian" Lesson Plans! Objectives: Students will brainstorm all the problems of stray dogs in a big city, categorizing them as long or short term problems. Students will brainstorm solutions to the problems. Students will brainstorm questions to ask WA2S on their visit. Objective: Students will do a week long survey of any lose dogs they observe in their own neighborhood. Objective: Students will write from the perspective of a stray dog to gain insight into the plight of stray animals. Perspective is a genre of writing. Objective: Students will research local phone numbers to call if they see a stray. The numbers will be developed into magnets to keep in the car or at home on the refrigerator. The World Animal Awareness Society Operates Through the Generosity of; Families & Individual Citizens, Private & Public Foundations, and Public & Private Corporations by Providing Financial Support Through; Donations, Grants, and Sponsorships.